By the way, Santi Comesaña is from ED Val Miñor - in fact, he had the opportunity to go to Celta as a child, but neither he nor his family were convinced of making the leap then. And even before Rayo signed him, Spanish newspapers such as the Atlántico Diario, Ferrol360 and Vavel were singing his praises while he was at Coruxo. La perla, they called him. 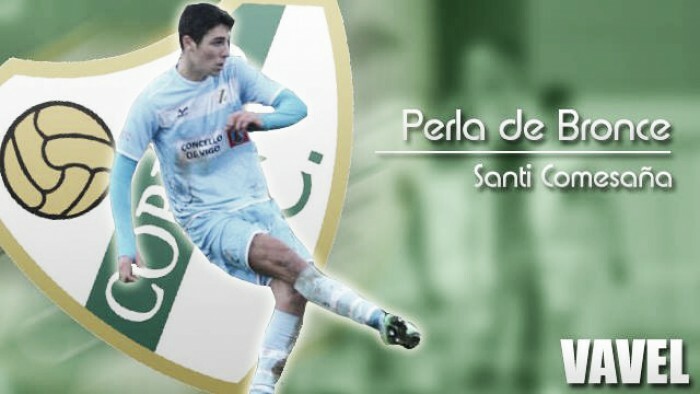 Santi Comesaña, signed by Coruxo in 2015 from ED Val Miñor, went on to score on his debut against Atlético Astorga FC, and even score a hat trick against Compostela. Eight goals and 37 games earned him that move to Rayo - a move that Celta, again, tried to acquire, by attempting to sabotage the deal at the last minute. But even then, it was a risk. Rayo were placing their La Liga dreams - present and future - on a player who had up till then played one season of senior football - in the Segunda B. Before then, he had been playing youth football - in the juvenil División de Honor with Val Miñor. "[How have I gotten to where I am?] Work, work and more work." Last jornada against Osasuna was one of many times where Rayo's midfield can play exceptionally well and work extraordinarily hard, and yet get battered by teams of similar quality. A lot of that hard work has fallen on Santi - and he has delivered. Others have not, though, and he has been quite visibly upset with a number of fellow teammates. Not just on the pitch either - after the Osasuna game, he cut a frustrated figure while describing the team as having a "poor dynamic". But that is to be expected from someone so young. What's more dangerous are the media comparisons to Roberto Trashorras. To be fair, being from Galicia, the comparisons to a younger Trashorras were inevitable. Santi, too, is 6 feet tall, and at Coruxo played in attacking midfield, in center midfield and on the left. He, too, has an eye for goal. He, too, keeps the ball at his feet rather than give it away. When asked which player he would like to be like, he said Sergio Busquets. And has been public with Trashorras' influence on his game. Perhaps, it is a metaphor for the transition from the present to future.